Register Log In wirral forums Forums National News Poor Nigel! I really felt quite sorry for him trying to talk up a blue passport as a great triumph for freedom, democracy, the British people, sovereignty, UKIP etc. In fact, it is not the old large stiff inconvenient ones we've had in the past with two windows in the cardboard, it is tory-blue version of the smaller floppy EU one. It contains the same type of chip containing your biometrics and no doubt complies with the same electronic protocols as the EU one does. 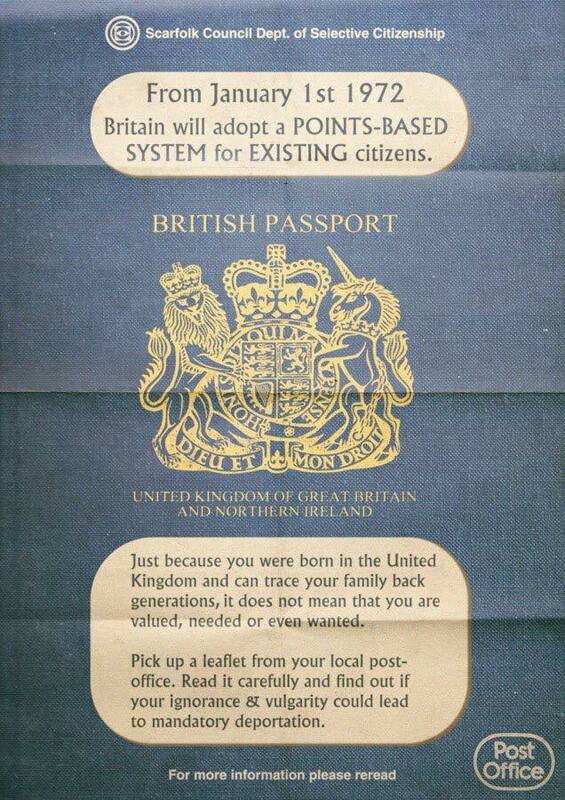 In my opinion, the whole idea of a passport implies a restriction on your freedom, whoever it comes from. Why on earth should your freedom to roam the planet be constrained by governments anyway? They were originally introduced as an AID to travelers. A piece of paper backed by the government telling other government that the holder was a good chap and should be allowed free entry. Over the years it has morphed into a way of preventing those the government doesn't want to travel from doing so. Hardly something to celebrate in the name of freedom is it. But I felt sorry for Nigel, attempting to do so. He was about as convincing as a chocolate teapot! Of course the biometrics comply with the same as the EU ones, they both conform to the ICAO standards, it would be no use having a passport that doesn't comply with international standards, it is after all primarily for travelling abroad rather home use. The UK biometrics don't have as much information as many other countries have, its basically your picture and data, many other countries have fingerprints as well. The burgundy colour wasn't obligatory under EU rules. I'm quite happy to keep passports because they track criminals and in the absence of having national ID cards they are useful for proof of identity. Well, can see that as it's the only thing that's changed you have no option but to declare it a triumph. Kindly explain how this changes anything at all? The (red) EU passports were issued by the UK. The (blue) UK passports will be issued by the UK. Apart from the colour they are virtually identical! You, and I as plebs living on Merseyside will be treated in exactly the same way. The only difference will be that you won't be able to afford travel quite so easily. I can't imagine this government missing an opportunity to rip us off. My bet is you'll have to buy a new one, and the cost will probably be even higher than the old one! Scare tactics again and you know it ! As I understand it existing passports will be replaced when they are due for renewal. According to the Guardian, it will mean more delays for Brits at airports. But this is all worth it, of course. As we have a British passport, the world will gaze enviously at us in our long queues as they speed through the barriers! My children from a previous marriage to an Irish national have very sensibly paid �30 to the Irish Government and secured dual nationality and will travel using an Irish passport. Lucky them! What a brilliant thing brexit is! Scare tactics? Well, we'll see won't we! The same delays that we have when we travel to the majority of the rest of the world. Which generally aren't that much different from EU airports because we aren't in the Schengen Area anyway. EX....Do you have a lock on your front door and if so, why? To stop illegal immigrants from nicking his front door?